Hollandia (now Jayapura) on the north coast of the island of New Guinea. Hollandia was at the eastern edge of West New Guinea (West Papua). The destination was Vlaardingen, a suburb about 8 km west of Rotterdam. to recover what he claimed was part of Indonesia. United States favor with the Indonesians. of the United Nations Temporary Executive Authority (UNTEA). UNTEA took over on October 1, 1962, and ended April 30, 1963 when Indonesia took control. and Indonesia in handling this affair is not a pretty story. There is only one CDS used to cancel all three stamps. 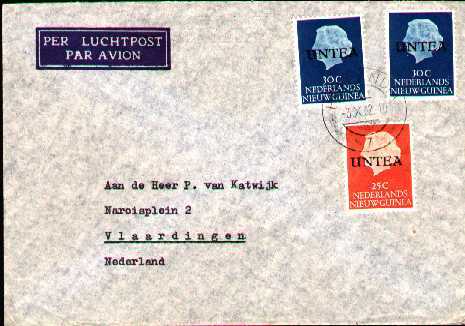 of existing Netherlands New Guinea stamps using a letterpress. A total of 19 different values were overprinted. Eleven values were made available on October 1, 1962. The remaining eight values were not made available until November 1. The only first day service was in Hollandia and then only on blank covers. There are backdated first day covers made with CDS 7 as used on this cover. There were no first day service covers. You can find the stamps here. which were backstamped and subsequently addressed. Here is a cover that did have a less philatelic nature. This cover was cancelled on the 3rd day of availability. philatelists buying through the New York, Geneva, and other sales agencies. Some from the subsequent printings actually found their way to New Guinea and were used there. one 25c red Queen Wilhelmina (Scott 12 and 11). The quantities printed were 241,000 for the 25c and 216,000 for the 30c.